Moderate. Young seedlings tolerate frost easily, but mature plants are damaged by freezing weather. Mix a light application of a balanced organic fertiliser into the soil prior to planting. In early summer, drench plants with a liquid fertiliser to prolong bloom time. Beans. 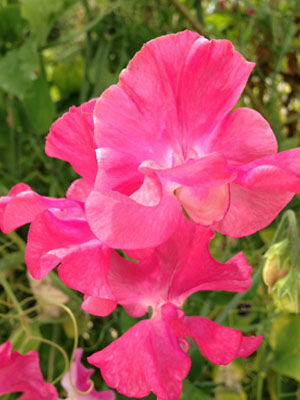 Sweet peas need a fence or other support, and you need easy access to cut blossoms for bouquets, so it is best not to crowd them with other plants. Small mound-forming annuals like sweet alyssum can be grown at the base of tall sweet peas. Before planting sweet pea seeds, nick the outer seed coat with nail clippers to help speed germination and soak in water. Plant sweet peas in the autumn in areas with mild winters which helps them establish good root systems, or first thing in spring in other areas. Sweet peas are a beautiful way to cover a chain link fence. Some varieties are much more fragrant than others. Colours include pink, white, red, purple, burgundy and many bicolours. Clip stems for indoor arrangements when half the flowers are open. Snipping off old flowers will help prolong bloom time. Pea aphids are common sweet pea pests that may require control with insecticidal soap.